One of the meanest, toughest and most opportunistic fish to be found anywhere. They are true predators, and really don’t care how they fill their bellies. In the period of roughly 3-4 weeks after ice-out, these fish can be found absolutely stacked in warming back water bays, actually competing for a fisherman’s offering. The water temperature in these areas can be warmer by 20 degrees F, compared to the colder water of the main body. This is truly sight fishing at its finest. The only reason you will ever yank your bait away from a 40” northern is because at the Lodge at Little Duck there might be a bigger one behind it. As the season progresses and the main body warms, the pike will find other shallow areas to inhabit, but these areas will be adjacent to deeper water drop-offs where the main food source for the Pike will be during the summer months. 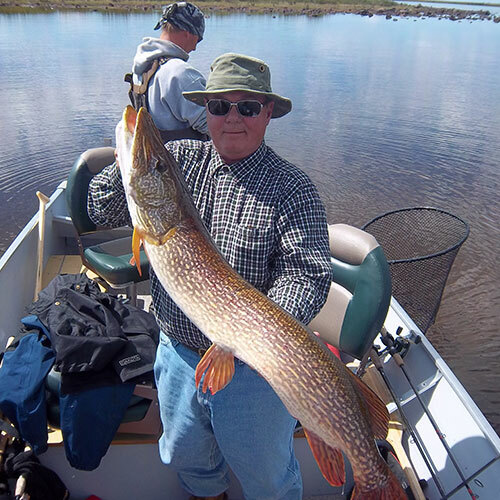 In the fall, and as the water starts to cool, you will find Pike again stacked in the shallows and in the vicinity of what’s left for weed growth. 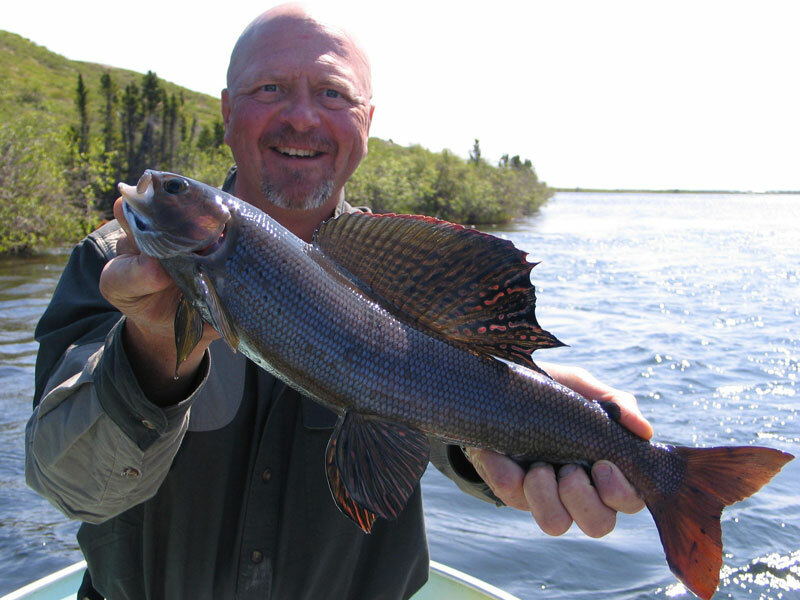 It is also an amazing time to fish for Pike as you are catching Lake Trout in some of the same areas. Arguably one of the most powerful of all fresh water fish. Lake Trout inhabit almost all areas of our lakes, from shallow areas, fast moving water and bays, to the deeper drop-offs of the main basins. They mainly feed on Lake Cisco and Whitefish, but once they reach a trophy size, they become cannibals of their own species. It is said that you cannot reel a lure fast enough to get your hook away from these prized fish, but then again, why would you want try. Unlike lake trout in the more southern areas, these fish from our cold and clear waters are a true delicacy when cooked over an open fire by your guide at shorelunch. 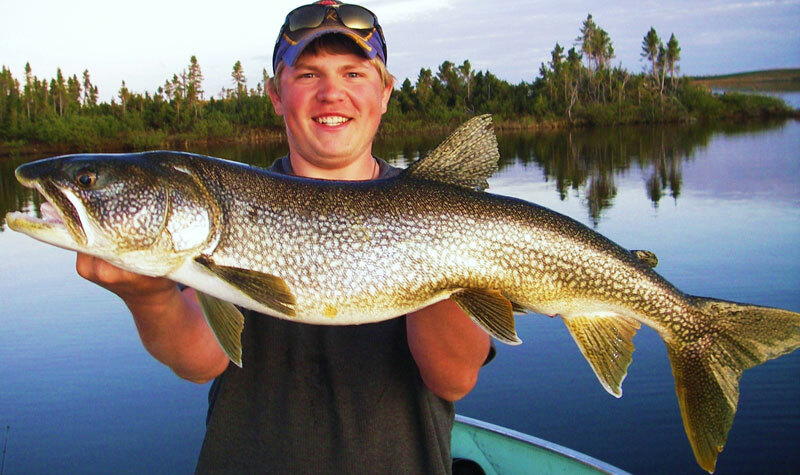 Most of the fishing for these monsters is done by trolling large “flashy” spoons, but can also be had by jigging the deeper areas of the lake and also casting in the rivers and streams. By far, one of the most beautifully colored and patterned fish in all freshwater!!! We often refer to these amazing fish as the “small mouth” of the north. Pound for pound, nothing in the north fights with the determination and grit than that of the Grayling. These fish have become extremely symbolic of the pristine environment that is needed for their survival and the crystal clear water they inhabit. Once hooked, they dig their enormous and colorful dorsal fin into the fast moving water, while also utilizing their powerful tail and are a true challenge to land. While spawning occurs in the spring time, they will eat almost anything that moves including aquatic insects such as Black, May, Caddis and Stone Fly’s. Many people after spending the day fishing from a boat enjoy being dropped off and walking the shoreline of the Wolverine River in the afternoon in search of the perfect backwater eddies and pools that hold these amazing fish in numbers. Talking about a great way to finish off the day!!! !